"I dusts" exhibition at "The Composing Rooms"
Estrid Lutz (1993) & Emile Mold (1988) live and work in Marseille. They both studied at École nationale supérieure des Beaux-Arts, Paris and graduated in June 2016. 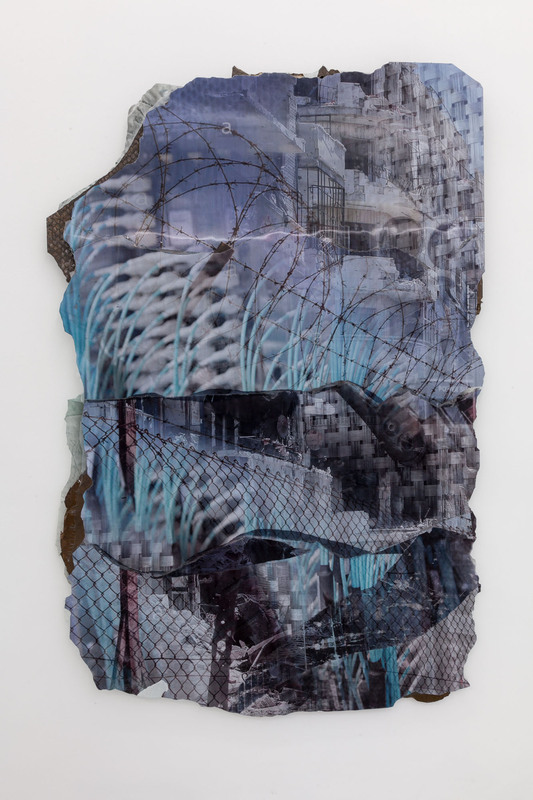 The exhibition includes five 120x180cm lenticular collages, made of interlaced images – found, photos taken from their car windows, 3D modelled objects – and three sculptures, made of mesh guard, foams, and technical materials including carbon fibers. Combined and merged they serve the apparition of a shifting unified collection of associative imagery. Lenticular flip technique is usually limited to only two images. In this case, saturating the medium by using at least six images graft to one another allows for a wider comment on the represented subjects by extracting them from their original media environment and affective context. 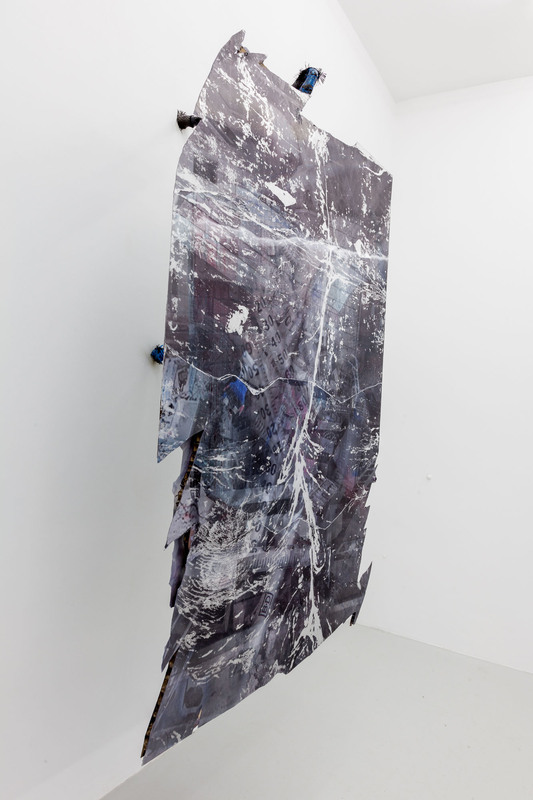 The works are photographic objects, the lenticular elements merging via manual destruction with a background layer of metal debris. Working at the bleeding edge of photography and sculpture, the duo challenges the boundaries of contemporary image/object making. The installation takes over the room, the materiality of the works resembling a bombed hightech public relations office, complete with sculpted human remains. 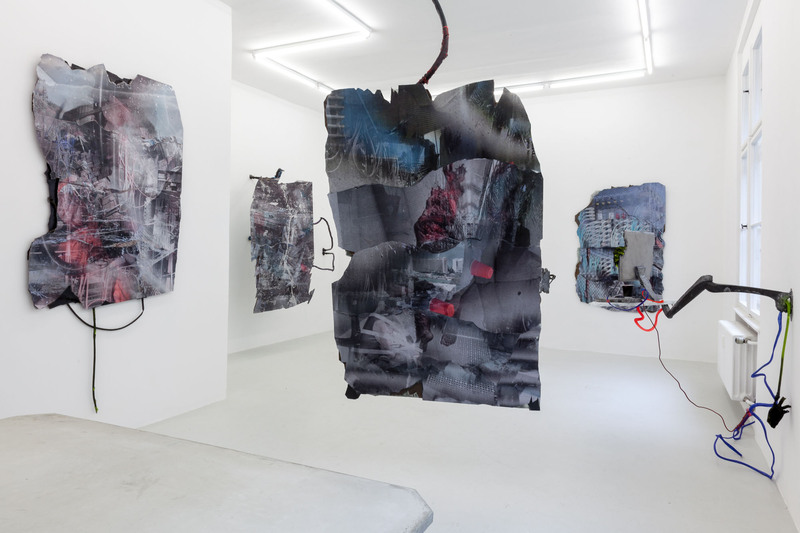 Crashes and ruins are useful metaphors for the work of Estrid Lutz Emile Mold: a crash combining the physical body and machine/s in a rough and dramatic collision, resultant of transport, a desire for a forward motion, a ruin as object of planned obsolescence, or intent of destruction. There is a rebellion to the clean and sleek, nothing opaque, surrealist, futuristic, hallucinogen, science-fictional, but credible, with real sadness, and emancipation. In this series, the main source of imagery was taken from the city of Marseille. The works are titled with different “zone” names, as a reference to how relations between “zones” and architecture has become a notable underlying pattern and structure of influence in global economy, circulation, and law systems. Marseille, a city with high cultural diversity, is representative of this zoning. On the one hand, it holds an autonomous port, which is at once a crossroad for violent expressions of contradictory powers and interests, and a representation of international trades and globalisation. On the other, it has identified and sectored quarters which have created their own local governing and social structures, some due to drug trafficking or due to being ignored and abandoned by state and city policy. Marseilles abandoned and neglected areas, now burned and increasingly covered in trash and graffiti, are becoming – much like the scrapyards – places of trash trade and collection crucial spaces for political leverage. 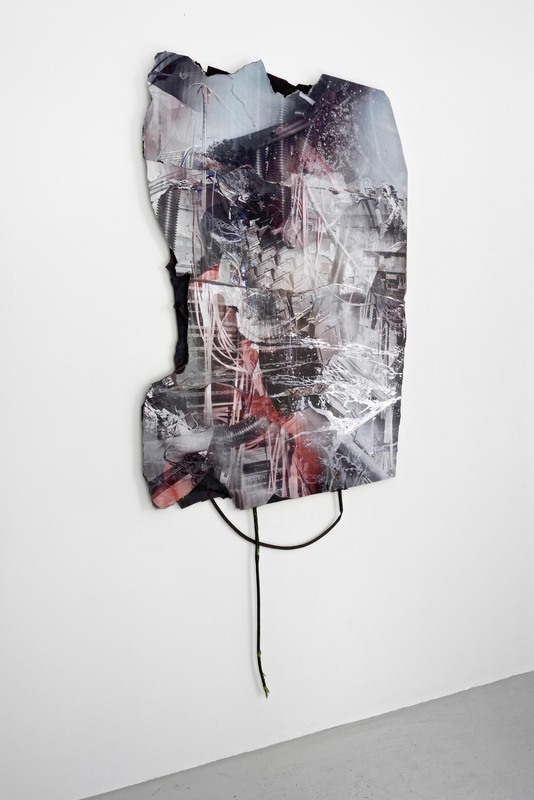 Further images were sourced from the internet, such as war ruins, chirurgical operations, cabling management, server racks, architectures or 3D rendered objects, being the underlying structures that make our daily information resources what they are, and the way they are injected into us, through open wounds of the effects.